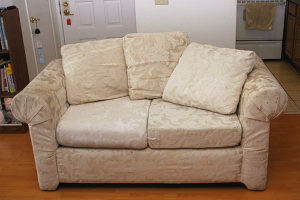 DIY loveseat disposal isn’t the most simple thing to do, no matter where you live. Because it’s old and out-of-date and it’s used, there’s simply not much demand for such a piece of furniture. You can think about it this way — if someone offered the same thing, would you jump at the opportunity? Or, would you politely pass and be on your way? Chances are excellent, you’ll decline it outright. Chances are excellent you’ve seen furniture on the curb of residential streets. If you take notice, that stuff just stays there, day after day. The local trash collection agency doesn’t touch it. And, because it’s been outside for a few days or more, no one is interested it taking it. This is often due to a couple of facts: it’s very heavy and it’s used. Garage sell it. Use the opportunity to sell a bunch of other items at the same time. This is a great scenario because you’re pairing down on possessions, while putting a little money in your pocket. Price it to sell and do not turn down low offers.